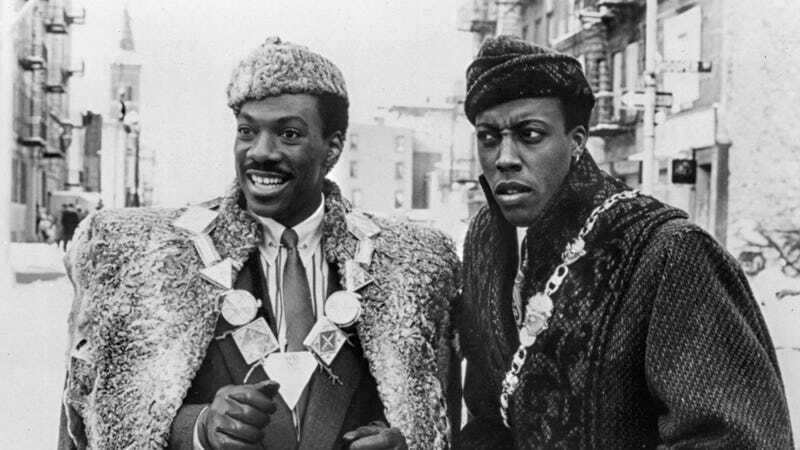 Earlier this year, we reported on the improbable news that Eddie Murphy’s classic fish-out-of-Zamunda classic, Coming To America, was getting a sequel, 29 years after it first entered theaters. Now, The Hollywood Reporter has details on the upcoming production, complete with news that 50/50 director Jonathan Levine will helm the new film, while Black-ish creator Kenya Barris is rewriting the script. Barris will be working from a draft by Barry Blaustein and David Sheffield, who wrote John Landis’ 1988 original. Of course, the big question still looming over the production is Eddie Murphy’s potential presence; according to THR, Murphy is “involved” and “expected to star,” but hasn’t signed any kind of formal deal to hop back into his old McDowell’s uniform and actually appear in the sequel.